Net Literacy is honored and grateful for the City of Carmel’s support and advocacy. Carmel, IN (April 18, 2011) – Carmel High School Net Literacy Student Volunteers will be honored at a special presentation by Mayor Jim Brainard; in recognition of the contribution that they are making in Carmel and throughout the state of Indiana. The presentation will occur on Monday, April 18 beginning at 3:30 p.m. at Carmel High School in the Business Department, Room F109. Mayor Jim Brainard will present the Carmel High School Net Literacy Student Volunteers with a Proclamation from the City of Carmel for their efforts refurbishing computers that were donated to students in the Carmel Clay School District who were without computers at home. In addition, they will be recognized for leading the effort to increase Internet Safety Awareness in Carmel and Central Indiana by creating an Internet Safety Public Service Address (PSA) awareness campaign. Currently, the PSA campaign airs on Bright House Networks. 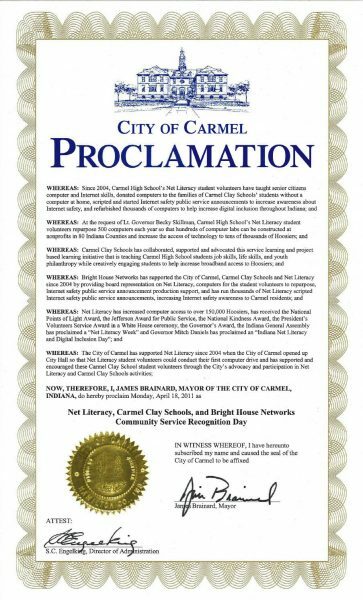 Mayor Brainard will also present a proclamation on behalf of Governor Daniels proclaiming “Indiana Net Literacy and Digital Inclusion Day,” recognizing the Carmel High School students’ contributions in a three year initiative. The initiative provides thousands of computers to hundreds of libraries, community centers, and nonprofits in more than 80 Indiana counties. Net Literacy’s student volunteers have been widely recognized by our nation’s leadership, including two American Presidents. In 2010, digital inclusion programs that Net Literacy’s student volunteers created were cited as good practices in the National Broadband Plan developed by the FCC and presented to Congress. Also in 2010 and at the request of the Lt. Governor’s office, Net Literacy’s Carmel High School chapter undertook an initiative to donate thousands of computers to hundreds of nonprofits so that they could build or expand computer labs in 80 Indiana counties in a three year program. At the halfway point, Governor Daniels proclaimed March 1, 2011 “Indiana Net Literacy and Digital Inclusion Day” recognizing these student volunteer’s efforts to help increase digital inclusion throughout the State. Bright House Networks and Net Literacy joined forces in 2004 with a mission to increase computer access across Central Indiana and educate youth on the importance of Internet Safety. One of the most significant accomplishments of the partnership is the creation of a Bright House Networks – Net Literacy Internet safety public service awareness campaign. The campaign was scripted by and stars Net Literacy Student volunteers talking about tough Internet safety issues such as cyber bullying, sexting, social networks and many other tough issues youth face online. The Internet Safety PSA campaign has been reviewed by the Indiana Department of Education, and can be seen in its entirety by visiting www.safeconnects.org. For more information about Bright House Networks, visit www.brighthouse.com. For more information about Net Literacy, visit www.netliteracy.org.